Toronto, ON – The Ontario Hockey League today announced that Sarnia Sting forward Nail Yakupov is the recipient of the Emms Family Award presented to the OHL’s Rookie of the Year for the 2010-11 season. In addition, Yakupov was named right wing on the first of two OHL All-Rookie teams that were announced today. Yakupov, a 17-year-old from Nizhnekamsk, Russia, led all rookies and finished tied for fourth overall in league scoring with 101 points in 65 games scoring 49 goals and 52 assists. Eligible for the 2012 NHL Entry Draft, Yakupov becomes the first member of the Sting organization to win this award in the 39 years it has been presented. 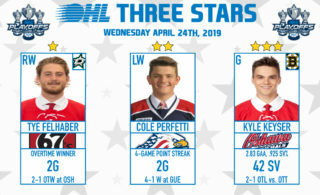 He is also just the fifth OHL rookie to reach 100 points in a season in the last 15 years following previous award winners David Legwand of the Plymouth Whalers who scored 105 points in 1997-98, Sheldon Keefe of the Barrie Colts who recorded 116 points in 1998-99, and most recently Patrick Kane of the London Knights who produced 145 points during the 2006-07 before being selected with the first overall pick in the 2007 NHL Entry Draft. That same season, Knights’ rookie Sam Gagner finished the year with 118 points. Yakupov also becomes the third Russian-born player to win the award following Evgeny Grachev of the Brampton Battalion in 2008-09 and Vitali Yachmenev of the North Bay Centennials in 1993-94. Selected by the Sting second overall in the 2010 CHL Import Draft, Yakupov was named the Kal Tire OHL Rookie of the Month three times. 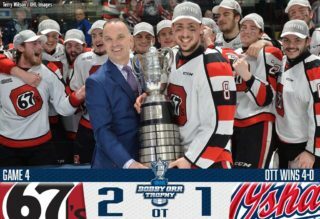 He produced an impressive 28 multi-point games including five four-point games plus a season-high five-point game in the Sting’s final home game of the season where he scored a goal and four assists as first star despite a 7-6 loss to the Erie Otters on March 17. Yakupov also established new Sting records for goals and points by a rookie surpassing the marks set by Steven Stamkos in the 2006-07 season. Joining Yakupov on the first All-Rookie team is teammate Alex Galchenyuk who finished second in rookie scoring with 83 points in 68 games at centre, with 2011 NHL Entry Draft prospect Lucas Lessio at left wing. 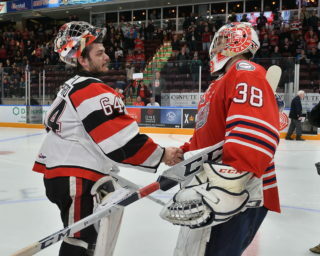 Nick Ebert of the Windsor Spitfires and Jesse Graham of the Niagara IceDogs were listed on defence, with Malcolm Subban of the Belleville Bulls in goal. Yakupov was the unanimous choice of the 19 other member club General Managers for this award receiving the maximum 95 points in the voting process. 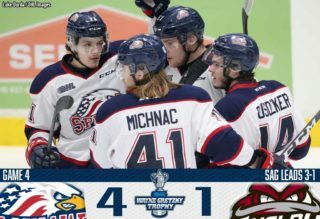 He finished ahead of runner-up Mark Scheifele of the Barrie Colts who finished with 28 points, and Alex Khokhlachev of the Windsor Spitfires who finished third with 25 points. The Emms Family Award was donated by Leighton “Hap” Emms, former owner of the Barrie, Niagara Falls and St. Catharines OHL franchises. The award has been presented to players such as Wayne Gretzky (Sault Ste. Marie, 1977-78), Joe Thornton (Sault Ste. Marie, 1995-96), Rick Nash (London, 2000-01), and John Tavares (Oshawa, 2005-06). Matt Puempel of the Peterborough Petes scored 64 points in 59 games last season to capture the award before claiming CHL Rookie of the Year honours.